These homemade ornaments were special to us in 2012 because we made them as a family with my daughter Gina, my sister Kaye, and brother-in-law Dean helping around the kitchen table. We purchased small wooden shapes and my brother-in-law Dean drilled a small hole at the top of each one for hanging on the tree. We used acrylic paints that we already had and mixed some colors together and put a glossy coat on top. We allowed them to dry overnight and then hung them on our tree which is decorated in almost all homemade ornaments. 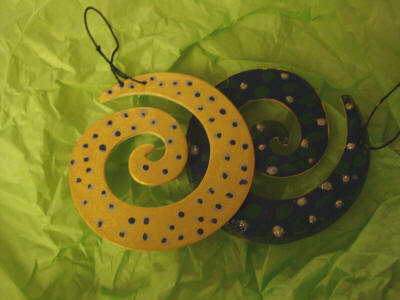 We liked the swirls and patterns and colors we chose and hope you will agree!